'I think Michael Cohen is in a lot of trouble,' Daniels' lawyer, Michael Avenatti, told reporters outside the court. 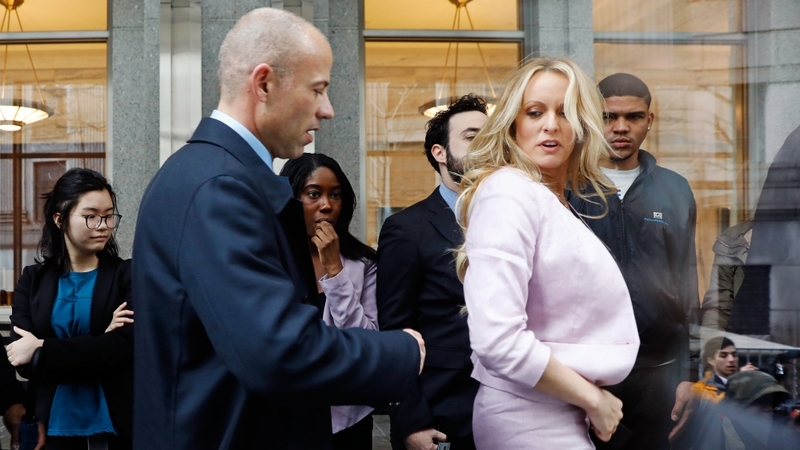 Avenatti and Daniels, whose real name is Stephanie Clifford, are not parties in the court case. Cohen is in court to ask a judge to limit the ability of federal prosecutors to review the documents seized from him last week. He has asked the court to give his lawyers first look at the seized materials so they can identify documents that are protected by attorney-client privilege. Prosecutors have asked that the seized documents be reviewed to identify those covered by attorney-client privilege by a 'filter team' of lawyers within their office, who would be walled off from the main prosecution team. A lawyer for Trump, Joanna Hendon, asked in a filing on Sunday to be allowed to review documents that in any way relate to the president, which she described as being seized amid a 'highly politicised, even fevered, atmosphere'. They disclosed in a court filing on Monday that Cohen had at least 10 clients in 2017 and 2018, and that he did 'traditional legal tasks' for three of them, including Trump, Republican fundraiser Elliott Broidy and a third who asked not to be named. Last week's raids came after a 'months-long' investigation of possible crimes related largely to Cohen's business dealings, rather than his work as a lawyer, prosecutors have said. Trump has called Mueller's probe a 'witch-hunt' and denied any collusion.